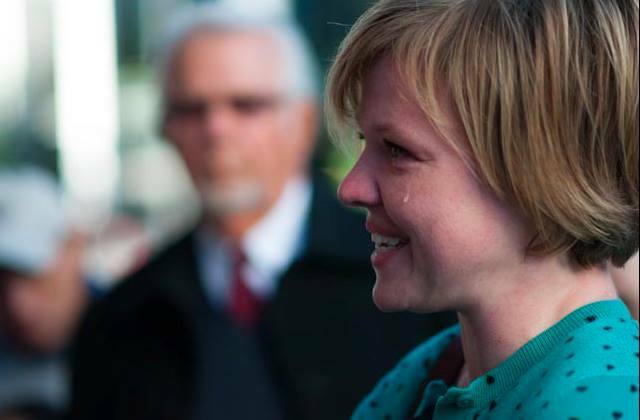 Stephanie Lauritzen, an OW action participant, being turned away from Priesthood Session. Photo taken by Josh Johnsen. On Sunday morning I flipped through picture after picture of women being turned away from the doors of our worship places. The Mormon Tabernacle choir sung in the background. Tears streamed down my face; many of those women are my friends. All are my sisters. Ah! Turn me not away, Receive me tho unworthy. Hear Thou my cry, Behold, Lord, my distress. I have performed this song countless times but the cry remains with me always. Hear Thou my cry. When I was 18 I swallowed two pills that changed my relationship to God. Growing up as a young, Mormon girl I knew without a doubt that God was my friend. I felt Their presence in my life and I strived to be worthy of it. When my thyroid gland malfunctioned and threatened to take my life I felt them holding my hands and promising me it would be ok. Those pills obliterated my thyroid, saving my life, but they also brought a brick wall crashing down between me and God. When I came out on the other side of my illness it felt as if God had abandoned me. I stood at the door of the wall and knocked. I begged. I screamed. I pounded until my fists were bloody. Hear Thou my cry. But They never answered. Answer me from Thy Throne, Haste Thee, Lord, to mine aid. Thy pity show in my deep anguish. Sometimes I hear God whispering through the wall. I whisper back, “Hear Thou my cry. Help me!” Every so often They send me visitors who wait with me at the wall. Though sometimes I slump on the door frame or lie down on the step, I am determined to wait. I will not be turned away. I want to be there if the door opens. Shield me in danger, O regard me! On Thee, Lord, alone will I call. I know what it is to be turned away. I know that pain. I, also, am guilty of turning away my sisters and brothers. I allow fear or arrogance into my heart. Sometimes I foolishly believe that I am exceptional, that I have nothing in common with those standing directly in front of me. I forget that we all can speak a common language of love and inclusion. That it was our Mother, our Father and Brother who whispered that love into our hearts, hoping we would remember it always. Oh the pain that we inflict on one another because we forget. O Divine Redeemer! I pray Thee grant me pardon, and remember not, remember not my sins. Forgive me, O Divine Redeemer! Many in our community are hurting from this rejection. The wound is fresh and raw. Hear Thou my cry. It is natural for those on both sides to lash out in fear and anguish. Our instinct is to steel our hearts and turn away from those who seem to be against us. I did not participate in the Ordain Women action for many personal reasons and even I have felt scorned for this. It is human to protect our vulnerabilities from others and I validate that need. Night gathers round my soul; Fearful, I cry to Thee; Come to mine aid, O Lord! Haste Thee, Lord, haste to help me! There is much from this weekend to mourn. There were talks by some of our leaders that felt like a slap in the face and tears sprung to our eyes. It is impossible to look at the faces of our sisters being turned away and not want to weep for their pain. The words and images of this conference still sting on our faces and in our hearts. Hear Thou my cry. But there are also moments to celebrate. Words of inclusion that are balm to deep, soul wounds. A strengthening sisterhood. And the knowledge that at least our cries are being heard, though not understood. Hear my cry! Save me, Lord, in Thy mercy! Let all of us remember in the days and weeks to come that our God and our Saviour would want us to approach each other with open hearts. With Love. Let us remember that differences of opinion are not a mortal sin but a chance for dialog. That the act of listening is an act of creation. Creation of thought. Of voice. Of common ground. Of Love. Let us speak the language of our Parents. Thank you, Jerilyn, that means a lot! Nothing like getting teary-eyed at lunch time. Thanks for this. I think the choir’s performance of “O Divine Redeemer” was the highlight of my conference experience. But, I didn’t really know many of the words. Your post shows even more why it spoke to my soul. Thank you so much for this, mraynes. O Divine Reedemer has always felt like the cry of my soul. I find myself singing it often in my day-to-day life. I love that the choir sang this song, it felt like a tender mercy amidst a very difficult weekend. Emily – I told my husband that same thing last night – the best part of conference for me was O Divine Redeemer. I’ve loved performing this song over the years, but it took on even deeper meaning yesterday. I don’t think the song will ever be the same again for me. As per tradition, my family always discusses our favorite parts. If not for this song– which was the only time I felt the Spirit– I would have nothing to say. I told him the names and stories of other women I know, other women who have touched my life with their love and faith and courage. “This is… This is…” over and over. When I neared the end, I asked him if seeing their faces helped him have more compassion for them. “Yes,” he answered. “A little.” I hope that compassion can grow in him, and in others like him. I hope compassion and the love you wrote so tenderly about can grow in myself. Thank you for sharing your own experience and heart cries. Thank you, Rachel. It can be so hard to be vulnerable with others who disagree with us, especially if they are loved ones.these types of encounters can be difficult and painful but hopefully they are also expanding for us. I love that you did this, Rachel! Thank you, Ziff. Sometimes such moments are extremely tiring, but I will keep engaging in them, because I want to help others see, as I want to see. There is nothing more powerful than looking at someone’s face and hearing their story. That is what calls us to empathy and responsibility. I can tell you with assurance that these women were not simply turned away. They were told the following, “The women had their own meeting last week, this meeting is for the men. You are more than welcome to listen to the priesthood session, as it is being streamed live, but the conference center is reserved for the men tonight. It was reserved for the women last week.” This is more than “fair” and completely acceptable. That’s actually not the point of this post, Camille. The point is that, whether fair or not, these women were turned away and they are in pain because of it. They don’t hold the market on this, we have all been turned away at times and we have all felt pain. It is part of our baptismal covenant to mourn with each other and love without exception, even if we don’t agree. I absolutely agree with you on that point, Meghan. We have all felt pain and have been “turned away” at times in our lives. To emulate our Savior, Jesus Christ, we must mourn with those that mourn. I even believe that I should mourn for those who feel sorrow for not being allowed in the conference center during the priesthood session, even if I believe it was the right thing. Just because I am not sad, does not mean others are not. Your post was very eloquent and thoughtful. Thank you, Camille. I truly appreciate that! I appreciate that you were willing to engage and share your feelings on the action. It’s important that we listen to all the sides of this conversation. But it was not reserved for women last week. It was presided over by men. Men addressed the women. And any man who showed up at the Tabernacle wanting to attend could (and some did). There is no such thing in the church as a meeting for women completely run by women without requiring some sanction by men. Precisely because the priesthood must approve everything. And priesthood is only extended to men. May I say also that this post was lovely and encouraging to my worn out spirit. Thanks, MRaynes. I’m glad my words could provide a little healing for you, MDearest. Love to you! Right. Allow rabid feminists to disrupt a worship meeting. Except it isn’t called “Men’s Session”, it’s called “Priesthood Session”. And how many times in the last two conferences have we been told “Men” =/= “Priesthood”…. My heart breaks. I adore you Meghan, beautiful writing. Thank you, Lisa. I adore you! This is beautiful and captures exactly what my heart is feeling. I’m glad I could articulate something you’re feeling. I’m also thinking about these words from the book of Habakuk today — which I happened to read on an iPhone app at 11pm as I was trying to fall asleep. I love this so much, Deborah. Thank you for sharing this here. So, so moving. Thank you for this! God does not turn anyone away. Hopefully God’s church will follow suit. Thank you for your kind and thoughtful words, Edward. Meghan, wow! What power! What humble faith! I often advertise my love for O Divine Redeemer. Like you I find myself singing it often, and feeling it always. The choir’s choice of this song certainly was a balm to the souls of many, but I can’t believe it was an accident. We are all knocking, those brave enough and faithful enough to do so knock the loudest. Bless you, Sister. Thank you EOR! I’m glad you find as much comfort in this song as I do. Like you, I can’t believe the inclusion of this song was an accident. I love this so much, Meghan. Thank you for sharing your thoughts. I do not know how anyone can listen to this without being moved to greater compassion and love for those who hurt. I love the Jessye Norman version so much! I linked to the Joan Sutherland versioning the post which is also glorious. It is amazing the power a song can have. I have always found this one in particular to soften my heart towards God and my brothers and sisters here on earth. Thank you for your words! Great post Meghan, conference offered some great highs and some sad lows, but people must persevere in love and patience. Thank you, brother. Love to you always! Meghans, your words here are just lovely. I loved to sing “O Divine Redeemer” back in the day. Thank you for reminding me of it and for pointing out how truly a propos it is to what happened in Salt Lake this past weekend. You’re welcome, it is such a beautiful song! This is powerfully written, MRaynes. Thank you for opening your heart to us–I needed someone to write and articulate this for me as so many things have been swirling around in my mind from conference. I needed this. Thank you. This is perfect, Mraynes. So so beautiful. Thank you for sharing your soul, your sorrow, and support for all sisters this past weekend. This essay is beyond beautiful. Looking at the photos and hearing a few of these brave sisters’ voices, I strongly feel there were men (there at the doors and, perhaps within the buildings) who felt the beginnings of awareness about the plight of their good sisters. It is impossible at this moment to know the full impact of this event. I suspect the Angels of Equality are whispering even now into many previously closed ears. God bless these brave women. And the song. Oh, my heart! Thank you. Beautiful as always Meghan, thank you. Those pictures have already caused me more than a few sighs and tears, but I can’t stop looking at them. Thank you for writing this with “O Divine Redeemer”as the context. I don’t think I’ll be able to look at the photos without that song playing in my head. I’ve had this beautiful Spanish version on a YouTube playlist for years. Great post, Meghan! Great connection with the hymn. It was an irony and a mercy to have O Divine Redeemer sung in Conference. Thank you for your thoughts on it. Hey Meghan, times are changing,little by little. I wanted to sing O Divine Redeemer in Sacrament meeting with a non-member friend when I was in college. I was told it was not appropriate for our church, I don’t remember how, but we did get to sing it. this music is so close to my heart. Has anyone addressed the irony the OW was told they couldn’t attend the priesthood session by a female spokesperson?